Penelope & Parker – Available for Adoption! Hi, we’re Parker and Penelope, 7 seven year old brother and sister and more importantly, best friends. We’ve been together our whole lives and want to keep it that way. My sister, Penelope is more excitable than I am, but that’s okay. I just let her do her thing. Sometimes she tries to get bossy with our foster siblings and if they snap at her, I jump in the middle. No one is messing with my sister. I’m twice her size, so our foster sibs back down right away and I don’t even have to get mean. I think my size scares them. I don’t think they’ve figured out yet that I wouldn’t hurt a flea. My foster mom has me on a diet because I’m such a big boy. When she walks me or I get to playing with my sister and foster sibs, I start to breathe pretty hard and wheeze a lot. My foster mom says that will get better when I lose a few pounds. My sister doesn’t have that problem, because she’s little. My foster mom is really happy because Penelope and I can stay inside all day when she and my foster dad are at work and we don’t have any accidents. They don’t even have to kennel us! My foster mom has two beds for us, but somehow Penelope always seems to end up in my bed with me. In fact, if I’m sleeping on my mom or dad’s lap, my sister has to be right there too. Sheesh! She can be a real pain, but I really don’t mind. I’m used to it. My foster parents have two little grandkids that love to play with us. We don’t mind. We kind of like it. They also have a cat. Penelope and I never messed with the cat before because he’s super big, but our foster sibs like to run at him, so we do now too. He never runs away or looks scared, so I don’t really get why we do that. Huh. Anyway, Penelope and I would really like to find a family who will love us both. My foster mom says that should be super easy because we’re both so easy to love. Hope to meet my new family soon! Interested in adopting Penelope and Parker? 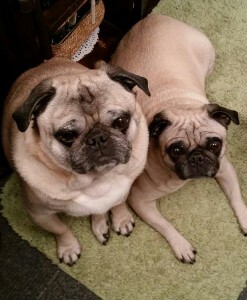 Please see our website and fill out an application at: www.pugpartners.com/adoption-application Penelope and Parker’s minimum adoption donation is $500.